Basil is a wonderfully aromatic and flavorful herb that can be used in a variety of recipes and dishes. Unlike many other herbs, however, it is not cold-hardy, so it has to be replanted every year. Luckily, basil grows very fast and thrives in warmer climates such as ours. 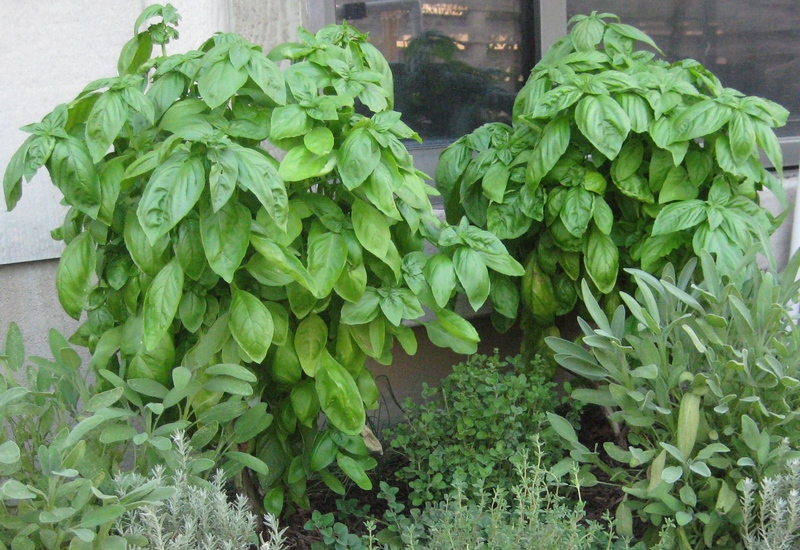 It is also very easy to grow, and, if it is maintained properly, can continue to yield great-tasting, fresh basil leaves into October and even November in our area. The trick to growing basil is to keep it from flowering. This can be achieved quite easily by pinching off the top growth of the basil plant every few days. Look at the photo below. This photo was taken looking directly down at the top of one of our basil plants. You can tell that it is attempting to flower by the cross-like pattern of leaves forming at the top. To keep it from flowering, simply pinch the top growth off down to the stem, right above the first set of leaves. By pinching the basil in this manner, you disrupt its flowering phase and the plant begins vegetating again. Keeping your basil in the vegetative state will produce a wider, bushier plant. Just look at the two plants above! If you do nothing to maintain your basil plants, it will not take long for them to start flowering, especially considering the heat here in Central Texas. When they start flowering, they will no longer produce abundant leaves for harvesting. Instead, all of the plant’s energy will be used to produce flowers and then seed. Also during this time, the plant will stop producing the oils which gives basil leaves their flavor. Plants that have begun flowering simply do not taste as good. Keep them pinched back and you’ll be awarded with an abundant basil harvest this year! Basil originated in Iran. It has been cultivated there for over 5,000 years. The Greek word for basil, basileus, translates as “king”. Basil is often called the “king of herbs” for this reason. Basil quickly loses its flavor when cooked. For strongest flavor, add at the end of cooking and serve. Basil leaves taste great whole in a mixed salad. Basil leaves can be stored in the freezer for months when prepared in pesto. Directions: Put chopped basil in food processor and add a tablespoon of oil. Chop well until it turns into a paste. Slowly add the additional ingredients with a little oil each time and continue to process until all items have been added and the mixture is thick, but smooth. If you want a little more texture, add the nuts last and don’t chop as much. Try this on some toasted bruschetta, or slather it on chicken breasts before baking. I took your advice about removing the flowers from my basil plant. I thought this plant was a goner at the beginning of the season so I just let it go to seed. Well it has surpassed my expectations. I removed the flowers and at the same time picked quite a few stems to use in a receipe. I made what I call chicken basil lasagna. I did not think it would come out well, but the family loved it. I used boxed lasanga, jar pasta sauce (chunky veggie), 2 small chicken breast, shreeded cheese (not very much) and of course lots of basil. I am glad that I gave that basil a second chance. I was also surpised at my thai basil it has come back with a vengence. I love using it in pasta and chicken broth, it taste like PHO, of course with a few more ingridents. Now I know you can keep the basil going (or at least for a little while) if you take off the flowers. I just wish cilantro would stay around untl the tomatoes and peppers are ready for some salsa and pico de gallo. Thanks. Basil is pretty forgiving plant and can take a heavy pruning. I’m glad yours is making a recovery. I haven’t tried growing cilantro yet, but I’ve been telling myself for months that I should. It’s a cool weather plant isn’t it? Fresh, homegrown pico does sound awesome right about now! Yes indeed, cilantro can fill up the “holes” when your basil heads off for winter vacation. Great post! Beautiful. Couple of questions, though. The very bushy plants you have in the bottom photo – is that just one plant each? Also, are they in the ground or in pots? How much sun do they get? I can’t seen to get mine situated right – always too much or too little sun. I’m in Cedar Park. Thank you. In the bottom photo, there are two basil plants. They were about a foot and a half tall by a foot wide. These plants were planted next to the east side of the house. They received early sunlight until about 1 PM, then they were in the shade. I watered them very regularly and pinched them back religiously on a daily basis. Oh, and they are in a raised bed, not in pots. I am growing basil this year again, but it is about eight feet away from the house – still on the east side. It dries out more quickly and receives sun most of the day. It is a little shorter and not quite as bushy. I planted another right next to it that I let flower and it is almost dead now, but not the one right next to it that I’ve been pinching back. I’ve discovered that some other creature(s) are enjoying my Basil as much as I am! I reviewed the list of suspects, and can’t find any that seem likely. anybody know what might be eating my basil leaves? it’s not spotty-type damage… it’s entire sections of the leaf, with soft, undulating curvature to the missing sections.